Wiring is the installation of cables and connected electrical devices like outlets and switches. Transmitting electricity within the building must be performed according to strict safety and quality standards. This means, it is the task that may be done only by certified electricians. The same thing goes for rewiring that may be needed in case your old wires get damaged because of aging, too heavy load, and other reasons, as well as during major renovation that includes architectural replanning. Interior and exterior lighting systems installation and repairs need to be planned properly and performed according to safety standards. This means not only sufficient lighting in every area of your house, but safety, reliability, and cost-effectiveness. The ideal way to guarantee the results you will be satisfied with is to entrust all lighting-related tasks to certified contractors. Apart from all other things, specialists will be able to help you choose the materials, switches, and other fixtures that will be best suited for your house and yard. Circuit breaker is a necessary equipment that protects your whole household electrical system from major damages. It automatically stops electric flow in case of overloads. The signs that you may need the new unit installation include the circuit breaker false triggering, flickering light, poor performance and damages of electrical devices. The signs of emergency situation requiring immediate technician’s visit are smoke and sparks. In any case, if you think there may be issues with your circuit breaker, do not attempt to solve them yourself. Contact certified electricians for diagnosis and further replacement. Electrical panel is a unit that controls the electricity flow across your whole house. You may need to upgrade it for various reasons, including major remodeling or adding new appliances and outlets. If you want your electrical panel to satisfy all your growing electrical needs and support the appliances in your house, you need its upgrade to be performed professionally. For that end, you should find a reliable company and book an electrician’s visit to make all the necessary estimates, plan and perform the further work. 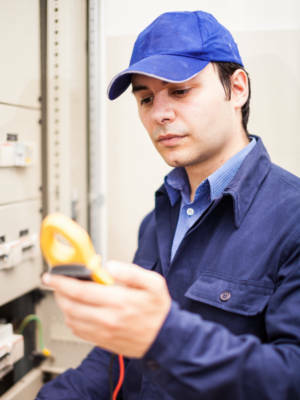 Regular electrical inspection implies thorough checkup of wiring, electrical connections, units, and fixtures. It may prevent most of the common problems within domestic electrical systems. This procedure can save you lots of money on costly repairs that may result from electrical faults. What is more important, it is sometimes life-saving, as some electrical issues may cause shocks, fire, and even explosion. Of course, the inspection needs to be performed by authorized, reliable electricians, who can diagnose all the problems correctly and suggest the optimal solutions. Bathroom and ceiling fans enhance air circulation inside the house. What is more, these units help remove excess moisture and odours. By that, they make the room more comfortable, prevent mildew and mold growth and interior deterioration. Installing or replacing ceiling and bathroom fans requires certain precautions and expertise, so it is better to entrust this job to a professional. An experienced electrician will be able to perform all the necessary works according to the current safety standards, rule out moisture-related electrical issues, and help you choose affordable and reliable equipment. The electric generator is an extremely useful appliance that may make your household more autonomous by providing electricity during power outage. Home generators vary in price, size, capacity, operational principle, and energy supply. In particular, there are units that work on gasoline, natural gas, diesel, propane, as well as alternative energy forms. To this, there are expensive whole house options and smaller ones that can provide electricity only for your most important appliances. An experienced contractor can help you choose the optimal generator type, depending on your needs and property size, and perform all the installation or replacement works properly. Home generators offer many benefits to their owners, giving them piece of mind and releasing from worries, related to power outages. However, just like any other appliances, the generators may fail at the most inconvenient time. Trying to fix generator yourself may be not only ineffective but life-threatening, especially if your unit works on highly explosive natural gas. So, to get a safe, fast, and high-quality repair, you should contact an electrical services provider that has all the right skills and experience to fix your type of generator. You may consider getting solar panels for many reasons apart from a desire to live a greener life. In particular, these units may help you cut the electricity bills, benefit from government renewable energy schemes, and get an additional source of power in case of outages. The process of solar panels installation is something much more complicated than just fixing them on top of the roof. This means, it is better to be performed by professionals so that you could benefit from all the solar energy advantages without any troubles. If you are building the house, new construction electrical services are essential part of the process to make it electrified. They consist of several stages, including planning and all the consequent works like wiring, service panels, outlets, lighting installation, and so on. All of these must be performed properly and in accordance with all the building codes for your area. To guarantee the best results, you need to choose a reliable and experienced contractor to handle the electricity-related works for your new building. Any modern building relies on electrical equipment that requires proper maintenance. Most of repairs and installations should be done by a professional electrician to guarantee the safety of the process and result. Even the smallest home’s electrical system is quite complex: wiring, breakers and other devices may need to be repaired or replaced over time. In some cases you may need to call a contractor providing emergency services the same day or even 24 hours a day, especially if you own an industrial company that relies on proper functioning of electrical equipment. Choosing the right professional in this case is very important as it is a matter of safety and your business’ well-being. To help you find certified residential and commercial specialists in your area, we have reviewed and listed top 10 local contractors. The only thing you need to do is to make the best choice for your needs.